You may not know it, but May is Celiac Disease Awareness Month, so let’s take this opportunity to discuss what Celiac Disease is, how it is diagnosed, and dispel three misconceptions about gluten. Celiac Disease (CD) is an autoimmune disorder that affects one in 100 people in the world and 2.5 million people in the United States, many of whom remain undiagnosed, according to the National Institutes of Health (NIH). People with Celiac Disease have a sensitivity and immune reaction to gluten, a protein found in wheat, barley and rye. If an individual with Celiac Disease ingests gluten, their body mounts an immune response that attacks their small intestine. In this assault, antibodies can destroy the villi in the small intestine. Villi are the small finger-like structures that help promote nutrient absorption from food. Those with Celiac Disease who ingest even a small amount of gluten—breadcrumbs from a cutting board for example—are at risk for small intestine damage. 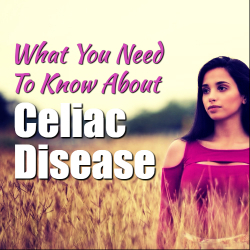 What’s startling about Celiac Disease is that if left untreated it can lead to the development of other autoimmune disorders like Multiple Sclerosis, Type 1 Diabetes, or diseases like intestinal cancer, epilepsy, and other debilitating health problems. The only treatment for Celiac Disease is a gluten free diet, and the initial way to diagnose Celiac Disease is to be tested through a simple blood test. 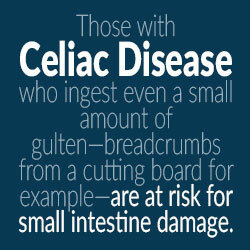 Additionally, many people may have sensitivity to gluten but do not have Celiac Disease. People with Non-Celiac Gluten Sensitivity (NCGS) may have the same symptoms as those with Celiac Disease, such as bloating, fatigue, depression, etc., but without the damage that is done to the small intestine. With that said, here are some of the myths that need to be dispelled about gluten and Celiac Disease. 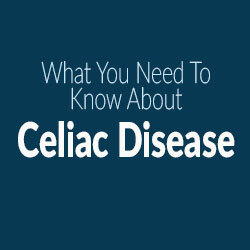 Celiac Disease is a recently discovered disease. According to the Celiac Support Association, Celiac Disease was discovered in 250 A.D. Celiac Disease has specific symptoms—the results of which have been found in skeletons dating as far back as the first century. Contrary to popular believe, Celiac Disease is very real, verifiable health condition that has been around for a very long time. Going gluten free is a great way to lose weight. Despite what some might believe, going gluten free on its own will not necessarily lead to weight loss. On the contrary, there are plenty of gluten free foods that are high in calories so consumers should beware. Now if you change your diet to the extent that you are gluten free and you are eating nothing but whole foods including plenty of fruits and vegetables, this may help you lose weight. But remember, unless you have gluten sensitivity, giving up gluten is probably not the best strategy to lose weight. Rather, choose a healthy, less restrictive diet that is specifically designed for weight loss paired with an exercise routine. Gluten intolerance, gluten sensitivity and gluten allergies all refer to the same thing. When speaking about gluten there is a lot of misinformation about allergies, sensitivities and intolerance. They are all separate health issues with varying severity. Non-Celiac Gluten Sensitivity is a diagnosed immune reaction with very real consequences. The broad-spectrum of symptoms that are associated with NCGS are often mediated by the immune production of antibodies IgA and IgG. A gluten allergy is also mediated by an immune response, but the reactive antibody in this case is IgE. These antibody immune reactions are signals from the immune system indicating that gluten is not a ‘friendly’ substance and its presence is no longer tolerated by the immune system. Generally, allergic reactions will clear up after exposure to the allergen has ended and leaves no lasting damage done to the body. Gluten intolerance refers to a body’s inability to break down gluten in the digestive process but, unlike CD and NCGS, it is not necessarily mediated by the immune system. There is a lot to know about Celiac Disease and the role gluten can play in one’s health and quality of life. If you suspect you might be gluten sensitive, talk to your health care provider about getting tested. Testing is the first step to finding the reason for your malaise and the first step to wellness. Remember, test— don’t guess. Cyrex is a clinical immunology laboratory specializing in functional immunology and autoimmunity. Cyrex offers multi-tissue antibody testing for the early detection and monitoring of today’s complex autoimmune conditions. Cyrex develops innovative testing arrays through continuous collaboration with leading experts in medical research and clinical practice. Cyrex differs from other labs by offering four pillars of excellence, including antigen purity, optimized antigen concentration, antigen-specific validation and parallel testing technology. Cyrex is based in Phoenix, Arizona and is a CLIA licensed laboratory. For more information please visit joincyrex.com/patients.